This was delicious, my whole family loved it. It was gone so quickly and everyone went back for more. The apples and onion combination is so nice, match it with the pork, amazing. Will make this again and again and again. I use Pink lady apples, but I'm assuming you can use any red apple. You could also use Granny Smith apples, they just aren't as sweet. Sprinkle the salt on your fillets, pour over the oil. Rub the salt and oil evenly over the fillets. Heat a tablespoon of the oil in a frying pan (that can go in the oven) over medium heat. Slice the pork fillet in half, so it can fit in the frying pan. Add the pork fillets to the pan and cook, turning every 3 minutes for a total of 12 minutes, browning the fillet all over nicely. Place the pork fillets on a plate. If there isn't enough oil in your pan from the pork fillet, add 1-2 tablespoons more oil now. Add the apples and onions, cook, stirring occasionally, for 5 minutes. While the apples and onions are cooking, rub the mustard all over the fillet. Sprinkle half of the thyme and the pepper over the fillets. Add the remainder of the thyme into the apples, stir. 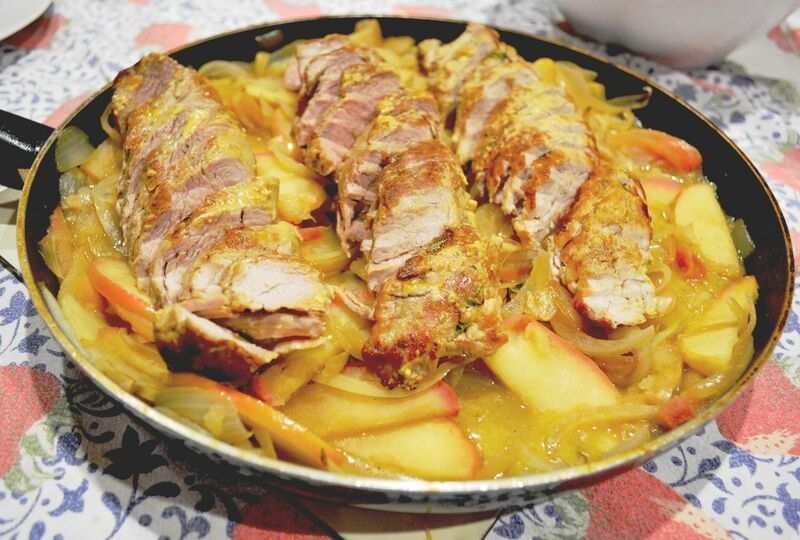 Place the pork fillets on top of the apple and onions. Place in your preheated oven. Roasting times are as follows, for thinner fillets 15 minutes, for thicker fillets 17 minutes. Transfer the pork to a plate, cover loosely with foil for 10 minutes to rest. While the pork is resting, return the apple mixture back to the stove top, over medium heat. Add the chicken stock, scrape the bottom of the frying pan if there are any stuck on bits. Simmer until the liquid has reduced by half. Add the butter and stir until melted. The sauce should now be thick and luscious. Place the apples onto a serving plate. Slice the pork into 1cm slices. If it is still too pink for you, which it shouldn't be, quickly sear it for 30 seconds on each side in a frying pan. 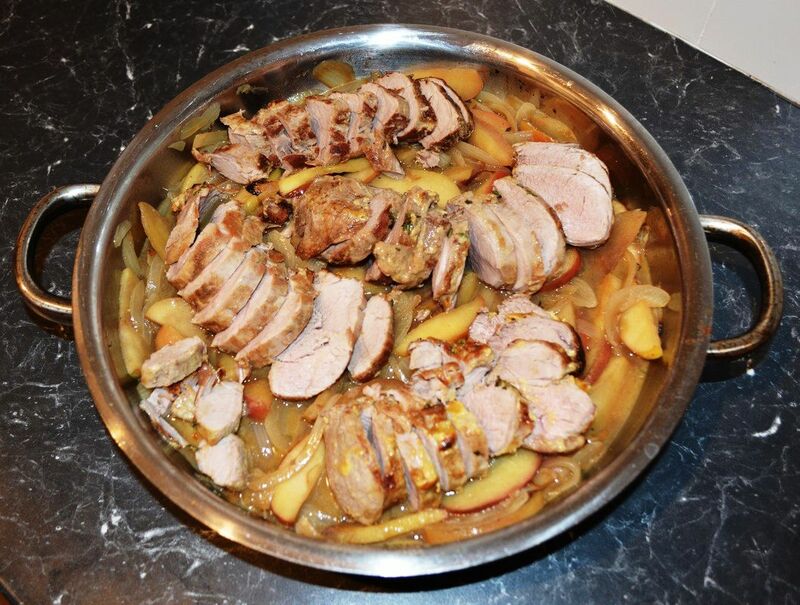 Place the pork over the apples, serve immediately. We had a simple green salad on the side.